Seminar participant learning to set type. Writers! The Center for Book Arts invites applications for our Letterpress Publishing Seminar for Emerging Writers. The next section of this seminar is scheduled for March 20-24, 2013. The seminar is tuition free for participants. Those selected must attend the entire five-day workshop. Participants will hear lectures from various professionals in the field – printers, fine press publishers, book artists, and dealers, to get a practical overview of letterpress printing and small press publishing. They will learn the basics of letterpress printing, both traditional typesetting and options with new technology, by collaboratively printing a small edition of broadsides. 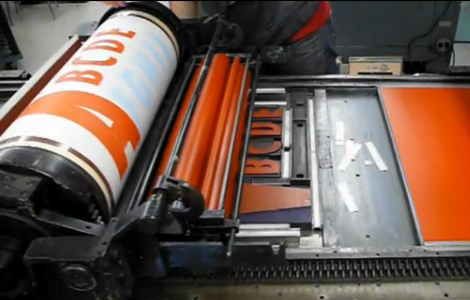 This workshop is most suitable for those with little to no previous letterpress experience. Postmark deadline is February 15. Application guidelines are here. The Center for Book Arts is pleased to continue our Scholarship for Advanced Studies in Book Arts. In 2013, the Center will award two to three scholarships to individuals who have demonstrated a commitment to the artistic endeavors in the book arts. The purpose of this program is to provide opportunities to emerging artists committed to developing careers in the book arts field, and to further the growth of this artistic profession. The award includes a cash stipend plus a materials budget and 24 hour access to the Center’s printing and binding facilities for a full year. Artists also receive a tuition waiver for courses throughout the year, planned in conjunction with the staff. Scholars will be required to complete an artist project by the end of the scholarship period, with an exhibition in our gallery space and public presentation the following autumn. Artists are invited to submit applications postmarked by May 1, 2013. Guidelines are here. The Center’s Internship Program is designed to provide a comprehensive overview of non-profit management and training in book arts techniques. Every year the Center brings in a small group of students for an immersive internship in book arts techniques and non-profit management. Interns get hands-on experience and come away with valuable technical skills. Primarily aimed at undergraduate students, summer interns can acquire practical skills in the book arts by working on The Center’s book projects and participating in The Center’s Education Program, helping to maintain the studios, produce editions, and installing our summer exhibitions. Interns will also assist in the day-to-day operation of The Center as needed. Deadline April 1, 2013. Details and application here. The Center for Book Arts invites curators to submit exhibition proposals for our Main Gallery. There is no deadline: proposals are reviewed by the Center’s Exhibition Committee three or four times a year, however, the exhibition schedule is planned at least 15 months in advance. Our Exhibitions program is intended to provide contemporary interpretations of the book as an art object and/or related media, as well as to challenge traditional notions of the book arts. Exhibitions that feature a broad representation of media, site-specific installations, and performances are encouraged. Guidelines are here. The Center for Book Arts invites artist members to submit proposals for its Featured Artist Projects Exhibition Program. There is no deadline: proposals are reviewed three or four times a year by the Exhibitions Committee. There is no entry fee but only current Artist Members may apply. Call for entries is here.